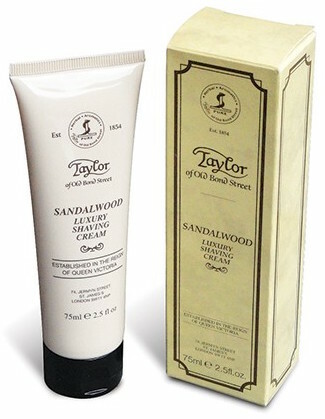 I probably would have never known about Taylor of Old Bond Street if it wasn’t for my Luxury Barber Box subscription. In fact, I found many new items for myself that came from having that and was really upset that I had to cancel but as soon as things get back to normal in my life I’d like to turn that back on again. I have the travel size sandalwood shaving cream which is about 2.5 fl oz it may not seem like a lot but a little goes a long way and this size is perfect if you just want to give it a try. I was hooked the first time I open the cap. This is not your ordinary sandalwood by any means. The list of notes is long and the combination of a complex woody aromatic fragrance for men. Top notes are lavender, rosemary, geranium and amber; middle notes are carnation, fern and orange blossom; base notes are sandalwood, patchouli, vetiver, powdery notes, musk, labdanum, cedar, and guaiac wood. The sent will linger for an hour or so after your shave along with your den as well. I used my R89 Grande along with my Zen Shave custom brush for this shave. I washed my face with warm water and dabbed just a little of the product on my fingertips. As soon as I started to touch my face it lathered. This was the quickest I’ve ever seen a shaving cream product do that. I was thinking maybe I should just continue using my fingers and forget about the brush but I couldn’t resist the brush made the lather even thicker and creamer and the scent was increasing as well. The slickness and glide were all first rate I had no issues and the post shave feel were one for the books. If you get the chance give this one a try. I have to say it was one shave I hope to repeat in future weeks. If you happen to really like the scent they also have a matching cologne too. I disagree a little bit with that encounter. With a vast assortment of blades (Feather, Nacet, Polsilver SI, Voskhod, Derby). I find it works equally well with them all, and it is quite forgiving of occasional sloppy technique. While providing a great shave. This is compared to the prior Fine Superlite Slantrazor . Which bothered me for a year requiring that above'really light touch'. Just working nicely with a Derby Extra blade in the long run.